Lavandula angustifolia (lavender most commonly True Lavender or English lavender,though not native to England ;also garden lavender, common lavender, narrow-leaved lavender), formerly L. officinalis, is a flowering plant in the family Lamiaceae, native to the Mediterranean (Spain, France, Italy, Croatia etc.). English lavender is commonly grown as an ornamental plant. It is popular for its colourful flowers, its fragrance and its ability to survive with low water consumption. It does not grow well in continuously damp soil. It is fairly tolerant of low temperatures, generally considered hardy to USDA zone 5. It tolerates acid soils but favours neutral to alkaline soils. In some conditions it can be short-lived. 'Pink Perfume' 24" x 18"
'Hidcote Giant'. A Lavandula x intermedias lavandin. Very vigorous grower (36 - 40 inches) with a lovely strong fragrance. This has large deep Lavender-purple flowers on very long 24 inch stems. 'Vera' 30-36". Thought to be the original species lavender, harvested for its oil. 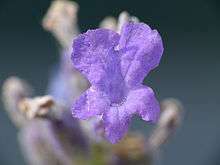 Lavandula hybrids are referred to as lavandins. 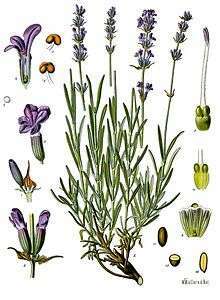 Hybrids between L. angustifolia and L. latifolia are called Lavandula x intermedia. They bloom later than the ordinary English lavenders. 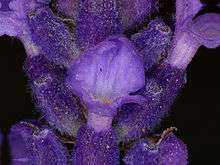 1 2 3 4 5 6 "Lavandula angustifolia information from NPGS/GRIN". www.ars-grin.gov. Retrieved 2008-04-12. 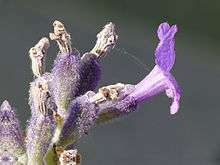 ↑ "Lavandula angustifolia". Natural Resources Conservation Service PLANTS Database. USDA. Retrieved 23 January 2016. ↑ USDA Plant Hardiness Zone Map. Retrieved on 2008-05-22. 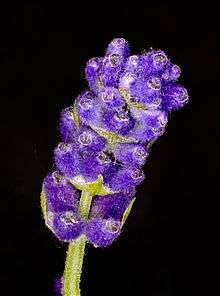 ↑ "RHS Plant Selector - Lavandula angustifolia". Royal Horticultural Society. Retrieved 21 May 2013. ↑ "Plants for a Future". ↑ Chladil and Sheridan, Mark and Jennifer. "Fire retardant garden plants for the urban fringe and rural areas" (PDF). www.fire.tas.gov.au. Tasmanian Fire Research Fund.